Spaghetti squash is super easy to cook in the slow cooker or Instant Pot (pressure cooker). Preparation is easiest using the slow cooker method, but the Instant Pot has time on its side. Using the slow cooker method, all you have to do is poke a few holes in the whole spaghetti squash; put it in the slow cooker with a little water. Set it and forget it! If time isn't a factor, this is an easy method. There's no need to cut into the squash until it's fully cooked (and softened). Some spaghetti squashes have a much harder outer peel than others, and they can split and crack as you cut them in half. This method eliminates that mess and hassle. Using the Instant Pot (or pressure cooker), you cut it in half, scoop out the seeds (or not), and cook the squash for 6 to 8 minutes. If you want your squash in a hurry, this is the way to go. It's even faster than the microwave method! Separate the squash into spaghetti-like strands and top with spaghetti sauce or toss with butter and seasonings. A mixture of parmesan cheese, basil, and olive oil is wonderful tossed with the strands. Or top it with your favorite meat sauce or a creamy alfredo sauce. A simple seasoned white sauce with bacon is another excellent option. See the tips for some recipe ideas. 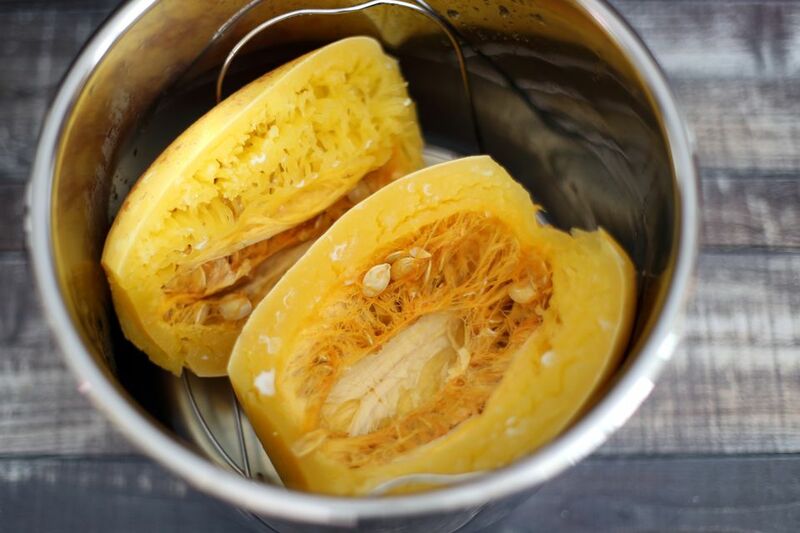 Make sure to use a spaghetti squash that fits in your slow cooker or pressure cooker. With a skewer or large fork, puncture several holes in the squash. Pour water in the slow cooker and then add the whole squash. Cover and cook on low heat for 8 to 9 hours. Scrape out the "spaghetti" strands and put them in a bowl. Serve the squash tossed with butter and salt and pepper, parmesan cheese or your favorite sauce. Cut the ends off of the squash. With a sharp knife split it in half lengthwise or crosswise (carefully, the squash can roll). If desired, scoop out the seeds. Place the steaming rack in the Instant Pot and add 1 cup of water. Place the spaghetti squash on the rack, cut-side up. Place the lid on the pot and make sure the vent is on "sealing." Using the "Manual" setting, set the Instant pot to 7 minutes under high pressure. Do a quick release and check the squash for tenderness. If necessary, reset and cook under high pressure for 1 to 2 minutes longer. Scoop out the seeds if you haven't already. Scrape out the strands of squash. Spaghetti squash has loads of texture but not a lot of flavor. Add a basic marinara sauce to the squash, serve it with a bolognese sauce or meatballs, or toss it with butter, salt, and pepper and pass the parmesan cheese. This recipe for spaghetti squash with a bacon cream sauce is a great way to make it a meal or serve it with a meat-free tomato sauce and parmesan cheese.